Very strong, low-stretch line constructed of twisted wire cable and protected with a tough abrasion- and weather-resistant forest-green vinyl jacket. Very flexible, easy to handle. Does not absorb dirt, wipes clean with a damp cloth. 5/32" Nominal Diameter. 50'L. Bagged. Green. 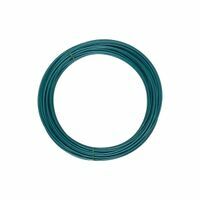 National Hardware Clothesline, Series: 2575BC, 0.14 in Diameter, 50 ft Length, 150 lb, Boxed Packing, Steel, Green, Plastic Coated, Resists: Rust and Mildew 15 gauge. 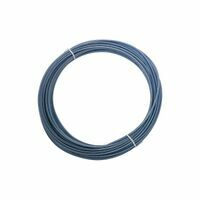 National Hardware Wire, Series: 2574BC, 50 ft Length, Steel, Blue Plastic Coated, 100 lb Load Multiple strands of wire assure greater flexibility with no loss of strength. Low-tensile, soft and easy to twist/tie. 12 strand. 50'. 9 gauge. Clothesline wire is durable and long lasting. Clothesline wire is durable and long lasting. Clothesline wire is durable and long lasting.